Two days ago, the Motorola One Vision was spotted on Geekbench with Exynos 9610 SoC, 6GB RAM, and Android Pie. Previous rumors pointed at it being called the Motorola P40, but this is likely a case of Chinese and global versions of the same phone. Now, the latest information that has surfaced aligns with those rumors while also revealing more details about this unannounced Motorola smartphone. According to the information received by XDA-Developers the Motorola One Vision, codenamed "Robusta2", will be powered by Exynos 9610 SoC. The smartphone will come with 3GB and 4GB RAM options, while storage will be either 32GB, 64GB, or 128GB. As evident from its name, the One Vision will be an Android One smartphone and will thus launch with a stock version of Android Pie. 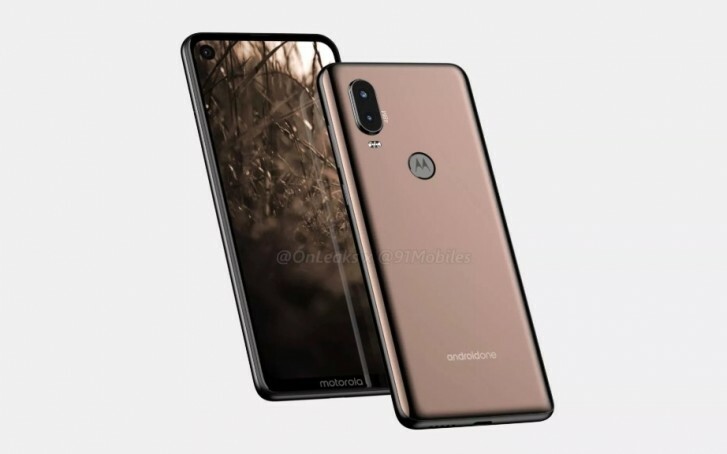 It will also likely get version updates till Android R.
The Motorola One Vision will come with a 21:9 display having a resolution of 2520 x 1080 pixels. XDA's source didn't reveal the size of the display, but thanks to previously leaked renders of P40 and the fact that One Vision is expected to launch as P40 in China, we expect a 6.2-inch screen. The One Vision will feature a dual camera setup at the back with the main sensor being one of those 48MP Quad-bayer units, which will capture 12MP photos. Motorola is also working on camera features called "Long Exposure" and "Video 3D HDR" for this smartphone. The former will likely help you take better photos in low-light conditions, but we don't know what the latter will do. The One Vision will have a 3,500 mAh battery under the hood and will be offered in at least two colors - Blue and Gold. The smartphone will be sold in international markets including Latin America, India, and Brazil, and it will hit the Chinese market under the P40 moniker. There's also a second Motorola smartphone powered by Exynos 9610 which is code-named "Troika". It's reported to have the same RAM and storage options and is expected to be sold in the Middle East, Asia Pacific, Eastern Europe, Latin America, India, and China. We expect to hear more about it soon.